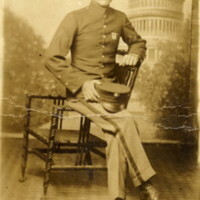 Dressed in his United States Marine uniform, Luther Wade Pilcher (1898-1918) poses on a chair in front of a backdrop of the United States Capitol. On his left breast is a rifle expert marksmanship badge. His rank at the time of the photo, corporal, is denoted by the three faint lines on his right arm. He would later be promoted to sergeant. Luther Wade Pilcher was born in Dothan, Alabama, on January 1, 1898, to Richard and Della Pilcher. He was the second of their five children. In 1910, the family moved to Noma, Florida, although Luther's last known residence was in Chipley, Florida. 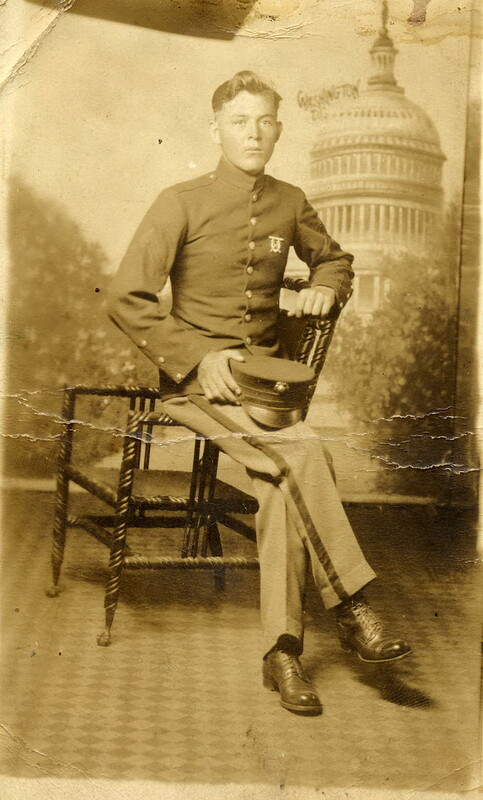 Pilcher enlisted in the United States Marine Corps on May 4, 1915, and served in Haiti and Cuba from 1915-1917. After the United States entered World War I, the 5th Marine Regiment was activated in Philadelphia, Pennsylvania. Pilcher and his regiment shipped out to France in August of 1917, arriving on the 22nd. The 5th was among the first of the American Expeditionary Forces to arrive in Europe. Pilcher and his regiment took part in the Battle of Belleau Wood in June of 1918. On June 6th, the bloodiest day of the battle, Pilcher was killed in action. He posthumously received the Distinguished Service Cross, the Navy Cross, and the French Fourragere for his service and sacrifice. He is buried in the Aisne-Marne American Cemetery at Plot B Row 10 Grave 68 in Belleau, France. Originally published by the Pilcher Family. Copyright to this source is held by the Pilcher Family and is provided here by RICHES for educational purposes only. Private collection of the Pilcher Family. Abney, Barb. "VA Selects UCF Historians to Archive Stories of Deceased Veterans Veterans." UCF Today, March 13, 2017. Accessed August 9, 2018. https://today.ucf.edu/va-selects-ucf-historians-archive-stories-deceased-veterans/. Clark, George B. Devil Dogs: Fighting Marines of World War I. Novato, CA: Presidio Press, 1999. Commonwealth War Graves Commission and American Battle Monuments Commission. "Luther Wade Pilcher (1898-1918)." Online database with images, Find a Grave. Accessed August 9, 2018. https://www.findagrave.com/memorial/55947669/luther-wade-pilcher. Florida Department of Military Affairs. "Luther Wade Pilcher." Online database with images, FloridaMemory. Chipley, Florida. Box 1. Accessed June 22, 2018. https://www.floridamemory.com/items/show/209562. Keene, Jennifer D. World War I: The American Soldier Experience. Lincoln [u.a. ]: University of Nebraska Press, 2011. Yardley, Jim. "When the Americans Turned the Tide." The New York Times, June 26, 2014. Accessed June 27, 2018. https://www.nytimes.org/2014/06/27/world/europe/world-war-i-second-battle-of-the-marne.html. “Luther Wade Pilcher.” RICHES of Central Florida accessed April 18, 2019, https://richesmi.cah.ucf.edu/omeka/items/show/10386.